The Millennium Dome was only open in London, UK for 1 year only and it closed on 31 December 2000. It is situated next to the River Thames in Greenwich, London, UK. There has been a lot of bad reviews about the Dome, but you had to be there to experience it and then decided. I had a brilliant time. It was so good that I went back in October 2000! What follows are a collection of the best photos from the day. This includes the outside of the dome, the zones and the millennium show. A lot of Lottery money was spent building and running the dome, but I say it was a lot of money to spend, but it was a great day out. Over 6.5 million visited the dome in 2000, making it the biggest tourist attraction in the UK, beating Blackpool Pleasure Beach and Alton Towers. These pictures on the following pages were taken on Wednesday 2 August 2000. There were many more pictures I could have taken, but film was expensive at the dome and I have run out! 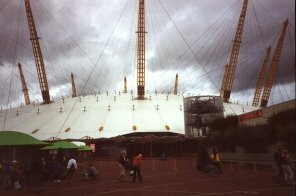 When I was in London, I visited the Millennium Dome. I didn't even pay the full price, as I got the ticket by spending £6 in Tesco Clubcard Vouchers. Normal price is £20. The Blackadder Goes Back and Forth, which was shown at Skyscape at the Dome (included in the ticket price) was shown on Sky One and also available on video. 1 : General Pictures. Here are some of the outside views of the dome and the first few sights within the entrance. 2 : General Pictures. The theme here is the Body Zone, the Work Zone and Spend a Million Pounds in a minute!